TPG Architects' directors have lived and worked in the region for more than 30 years. With numerous projects in North Queensland, from the Whitsundays to PNG, we have extensive experience in sustainable commercial, community, educational, residential and resort developments. Our ongoing commitment to understanding our clients' requirements is reinforced by the pragmatic commercial and design skills we bring to the project, with a thorough knowledge of the construction realities of building in the tropics. This is reflected in the practice's numerous repeat clients that we have been able to assist to successfully deliver award winning projects. TPG Architects and our directors are the most highly commended practice in the region. Roger is a founding director of TPG Architects. He has unique experience in the ability to adapt needs of projects to their particular sites. He has had extensive involvement in the Cairns CBD Masterplan, initially as a consultant in 2007 and now leads the Masterplan Review in 2017. Roger was Project Manager and Architect for the original conversion of the Tanks Arts Centre and recently received State and National heritage awards for both the conversion of Wharf Shed 3 into the Cairns Cruise Liner Terminal and the Cairns Museum School Of Arts Building. His close involvement with community groups always ensures his concepts are sensitive to the needs of users. 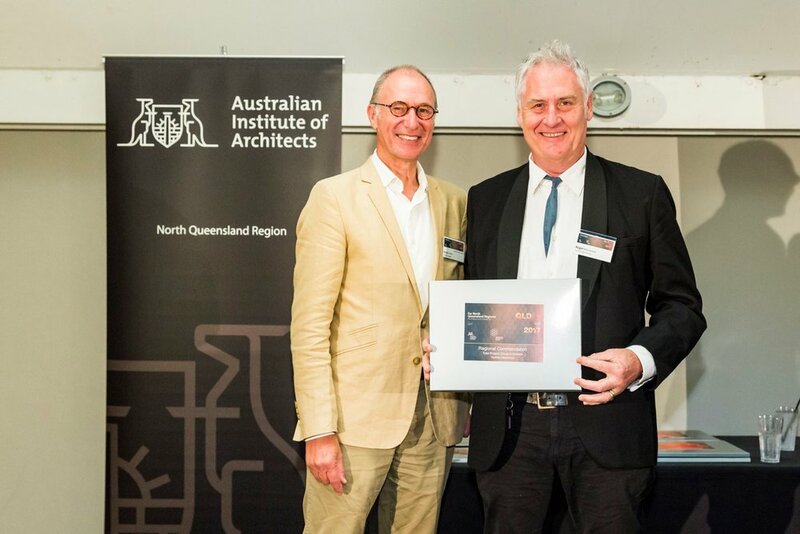 Roger's work on urban space and tropical design along with his studio work with JCU Urban Design students has been recognised with his recent appointment as Adjunct Associate Professor. With over thirty years of experience in the architectural and built environment industry, and as a founding director of TPG Architects, Edi has worked on numerous project types, including a range of education, sporting and public buildings. Many of these are award winning projects, including AIA Regional Commendations for Block F Good Counsel College Saint Clare's Performance Centre, the Tanks Arts Centre and Cairns TAFE Block J - Health and Sustainability Training Precinct. He brings a wealth of experience through his design and documentation to deliver many successful projects on budget and within programme. Edi has undertaken the Green Star Accredited Professional course and has successfully achieved ESD outcomes with Cairns TAFE ‘Block J’, the first 5 star educational facility in the tropics. Aimee has extensive experience in Revit documentation and has been awarded for exemplary documentation and presentation skills using the program at the International Revit Conference, where she has also been a workshop presenter. Aimee moved to Cairns in 2010 to work on a fully-integrated Revit BIM model for the Cairns Hospital Redevelopment. Since then, Aimee has worked on a number of health, government, community, commercial, tourism, residential and educational projects in the Far North. She has worked at all stages of project procurement from concept design to contract administration and has recently completed managing two educational projects in Innisfail and South Johnstone. Aimee’s interest in 3D design resolution and construction detailing, ensures potential construction issues are addressed during design development. Stefanie brings fresh ideas and strong graphic presentation skills to TPG Architects. While mastering in Digital Architecture at the University of Melbourne Stefanie developed an interest in communicating design using digital tools such as 3D modelling, rendering and walkthrough videos. Her ability to quickly generate architectural imagery assists clients in visualising concepts and engaging with every step of the design process. Stefanie started with us as a year 10 work experience student .....a while ago. Richard has almost eight years’ combined experience in architecture and four years in civil structural engineering where he has worked across a broad range of projects covering all building classes from strong involvement in schematic design to contract documentation. Richard has obtained experience in working on projects for the mining and agricultural industries, including remote health care centres in Cape York, Cairns’ TAFE commercial kitchen and training facility and various other community housing projects. Cathy has been in charge of our front gate for more than twelve years, keeps the money flowing in and out. Sophie joined TPG Architects in 2015 after a severe injury forced her out of her professional wakeboarding career. She completed her Bachelor of Architectural Design at QUT in Brisbane, before making the move back to her hometown of Cairns. She has travelled extensively and participated in elite sport as the captain of the Junior Matildas. Sophie has a strong ability to communicate and network with clients. Sophie has worked on community, sporting, residential and hospitality projects during her time at TPG. Her strong skills in graphic representation have been utilised in a wide range of projects and submissions. Liam is currently both studying and working to develop his skill set in design, documentation and presentation. He brings a fresh outlook to the team and has a keen interest in learning how to communicate design from sketching to technical documentation. Tom has completed his Undergraduate Degree in Architectural Studies and has recently joined TPG Architects. He is rapidly growing in his documentation and presentation skills through his experience on a variety of project types at varying stages. He is interested in tropical and Japanese architecture and learning how to apply this knowledge into TPG Architects’ current projects. Tom is enthusiastic to learn more about architectural practice, the design and documentation process and the National Construction Code and other regulatory codes. Alicia came to us for Year 12 work experience and continued the following 'gap' year. Now having completed second year Architectural studies at QUT, she is bound for a six month term at the Politecnico di Milano. In the meantime Alicia continues to spend the best part of her holidays with us. With a very personable and positive outlook Alicia always brings a passion to her design and drawing whether working in Revit, Lumion or Photoshop. Theo joined us for a couple of stints at work experience in year 12 and is now finishing his 'gap' year before commencing his architectural studies in Brisbane. Theo has mastered Revit and Lumeon whilst with us and we wish him well next year...we expect him back. Bella started work experience with us in 2016 and has continued part time in her gap year. In this time she has become proficient in the office operating systems, Revit, Indesign and Lumeoun and can complete any task with great accuracy, efficiency and with an eye for design and layout. Bella will always have a place in our office as she works through her studies.